The overpricing of some books on internet malls is commonplace and almost to be expected. The initial reaction to those who complain is 'get over it...' However when overpricing is grossly high and when it is allied to a poor or catchall book description (or none at all) then you can enjoy some righteous indignation. "No major defects: clean, complete, not falling apart; some light wear. A perfectly good reading or reference copy." Not falling apart! --at this price one would expect Nigel Kennedy's own pristine copy with two 500 Euro notes laid in and a long letter to him from Yehudi Menuhin loosely inserted! 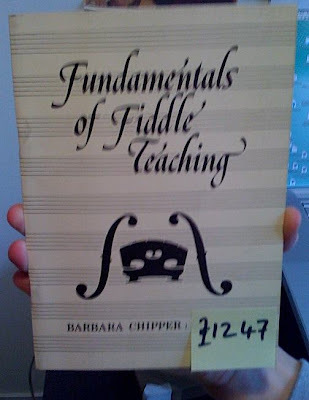 It is hard to imagine a circumstance in which someone might pay this price--possibly if If Barbara Chipper was a preudonym used by Sylvia Plath when she wrote violin teaching manuals or possibly Jean Rhys (aka Barbara Chipper) taught the violin in old age or if Warren Buffet or George Soros or the Google twins had been taught by Ms Chipper and wanted a memento to cherish or maybe someone needed the book in a multi million dollar lawsuit to prove a point or a major rock star demanded a copy in his dressing room as part of his contract...actually there are many reasons but the odds of the book selling are, say, 10,000 to one. How to price my copy I am not sure, at £100 it still looks barmy and I may be accused of being a 'Gopwo.' Of interest in the book is a piece about the effects of taking Oxprenolol for stage fright--Ms Chipper advises against it. ah, who sweet little girl that within a negligible number of year zo' n harry pot-delicate heart also without wand, however, break can and - for the fratsen of the boeboeks, there we it occur, and such as above the voordeur the gegrift stands ' everyone leest' , and as long as everyone reads that, is we glad, glad and joy-full. our actions do not go unnoticed. we do not work in ijle. not today, and also yesterday not! Fairly typical Babel gobbledy gook or Stanley Unwin goes Dutch! I heartily concur with you on these mad charges-- right on! Keep on scribbling. Oh man, you are like the guru of rare books but haven't you read about the methods of drop-shippers? In most cases they aren't real prices for real books. Those guys are speculating that someone somewhere will enter an order, and then they can source the book from a real source and drop-ship it without ever seeing it. Many of them have software that spiders the net for listings in one place that have a significant difference in another. They are stealthy software operators more than book sellers, juggling figures of money and keeping some of it, basing sales on customer inexperience. You can usually tell the software generated listings - from the generic description and the prices which usually are an unlikely figure (other than in the obvious sense) and end in .17 or .23 or similar. Maybe the software will adjust the price downwards when another copy is listed. Or maybe it's all just madness with no rhyme or reason at all! 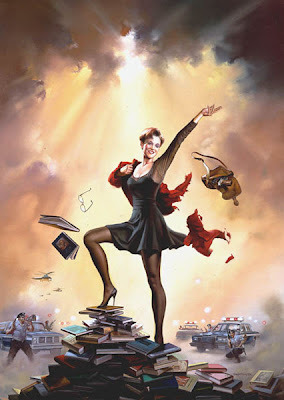 What a splendid illustration, love it - is it Julie Andrews? I too wondered about the dramatic differences in web prices for books. There are some eyepopping prices in Amazon for some really ordinary books - thank you pat and Segovia for the explanatory posts.